A brilliant taste for a brighter day. 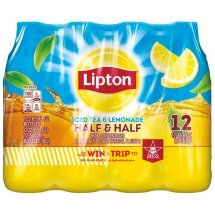 Lipton's expert mixologists have crafted a delicious blend of Lipton® Iced Tea with Lemonade to make the most refreshingly delicious iced tea for you and your family. Water, High Fructose Corn Syrup, Citric Acid, Lemon Juice Concentrate, Sodium Hexametaphosphate (to Protect Flavor), Black Tea, Natural Flavor, Phosphoric Acid, Potassium Sorbate (Preserves Freshness), Acesulfame Potassium, Gum Arabic, Glycerol Ester of Rosin, Calcium Disodium EDTA (to Protect Flavor).